The Coomera River is a perennial river located in the South East region of Queensland, Australia. Its catchment lies within the Gold Coast and Scenic Rim Region local government areas and covers an area of 489 square kilometres (189 sq mi). Rising in Lamington National Park below the Lamington plateau south of Binna Burra and a few kilometres north of the New South Wales/Queensland border, the Coomera River descends over the spectacular Coomera Falls in the Coomera Gorge. The river flows generally north through large rural properties in the upper reaches, joined by ten minor tributaries before flowing through high density residential and riverside development, particularly in the lower estuary where it flows into the Broadwater near Coomera Island and Paradise Point. Prior to reaching the Broadwater the river diverts into two streams to form the North Branch of the river that flows to the west and north of Coomera Island and heads towards Jumpinpin Channel to join the Pimpama River. 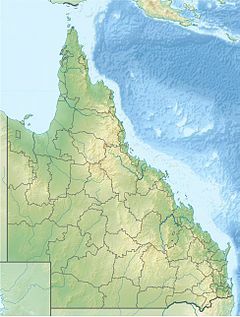 The main course of the river flows south of Coomera Island which heads towards the Gold Coast Seaway including flowing around the Sovereign Islands and Hope Island. Further upstream, the river flows around Foxwell Island. This river is one of a number which flow north from the Tweed Valley shield volcano. Downstream the river flows between Coomera and Oxenford. The Coomera River then enters the northern tip of the Gold Coast Broadwater at Paradise Point. The river descends 524 metres (1,719 ft) over its 80-kilometre (50 mi) course. Amphibious snake species have been recently sighted in the river catchment by geographers. The Coomera river catchment covers an area of 489 square kilometres (189 sq mi). The river's length is approximately 80 km. Freshwater parts reach mostly to a maximum of 1.5 metres (4 ft 11 in) but some parts at waterholes and below waterfalls can exceed 2 metres (6 ft 7 in). The lower estuary area is a fast-growing residential area. Sanctuary Cove, Santa Barbara, Riverlinks, Coomera Waters, Gold Coast Marine Precinct are all becoming home to increasing numbers of people. A former sand mine near the M1 is being investigated for development of a rowing course. The upper tidal areas are popular for waterskiing and wakebording. The upper Coomera River is home 18 regionally significant species including the platypus. The river is crossed by the Pacific Motorway and the Gold Coast railway line between Upper Coomera and Oxenford. Further multiple road crossings of the river occur upstream. The white discovery of the river was by Patrick Logan in May 1827. The waterway was originally named the River Arrowsmith after a London cartographic firm by Robert Dixon, a government surveyor. However Thomas Mitchell, the Colonial Surveyor General, overruled this and other names, replacing them with Aboriginal names. ^ a b c "Map of Coomera River, QLD". Bonzle Digital Atlas of Australia. Retrieved 27 September 2015. ^ "Coomera River Catchment". City of Gold Coast. Retrieved 27 September 2015. ^ "Pimpama/ Coomera Rivers Catchment and Estuary". Healthy Waterways. Archived from the original on 21 March 2012. Retrieved 26 September 2011. ^ a b c "Information sheet for the Coomera River". Directory of Important Wetlands in Australia. Department of Sustainability, Environment, Water, Population and Communities. 10 May 2010. Retrieved 26 September 2011. ^ Jensen, Jo; Barrett, Peta (1996). Patrick Logan. Moorooka, Brisbane: Future Horizon Publishing. pp. 25–26. ISBN 0-9587622-7-9. ^ Roberts, Beryl (1991). Stories of the Southside. Archerfield, Queensland: Aussie Books. p. 57. ISBN 0-947336-01-X. 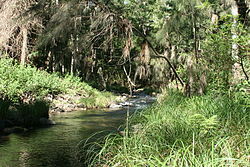 Wikimedia Commons has media related to Coomera River. "Coomera Catchment Management Group". Gold Coast environment: Protecting landscapes: Protecting catchments. City of Gold Coast. "Coomera Catchment Management Plans". 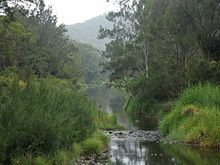 Gold Coast environment: Protecting landscapes: Protecting catchments. City of Gold Coast. "Coomera River environmental values and water quality objectives: Basin No. 146 (part), including all tributaries of the Coomera River" (PDF). Environmental Protection (Water) Policy 2009. Department of Environment and Resource Management, Queensland Government. July 2010. pp. 1–41. "Upper Coomera River - QLD195". Directory of Important Wetlands in Australia - Information sheet. Department of the Environment, Australian Government. 10 May 2010. GHD Group (10 May 2010). "Coomera River: Coomera Damsite (proposed)" (PDF). South East Queensland Regional Water Supply Strategy. Save the Mary River. p. -268.